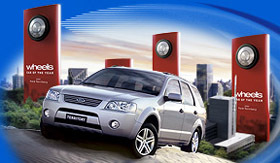 The SX Ford Territory was officially released on June 1 2004. This car is a pseudo family car, four-wheel drive, people mover all in one. The car is based on the award winning BA Ford Falcon. Replaced in October 2005 by the SY.